Implementing Mixpanel involves building with two APIs, Mixpanel and Mixpanel People. You’ll need to map out your events and user traits to be collected, decide which libraries and SDKs you need to collect that data, and install them into your product(s). Mixpanel event and people reporting is straightforward once data is flowing, but it’s getting the data flowing that takes the most time. 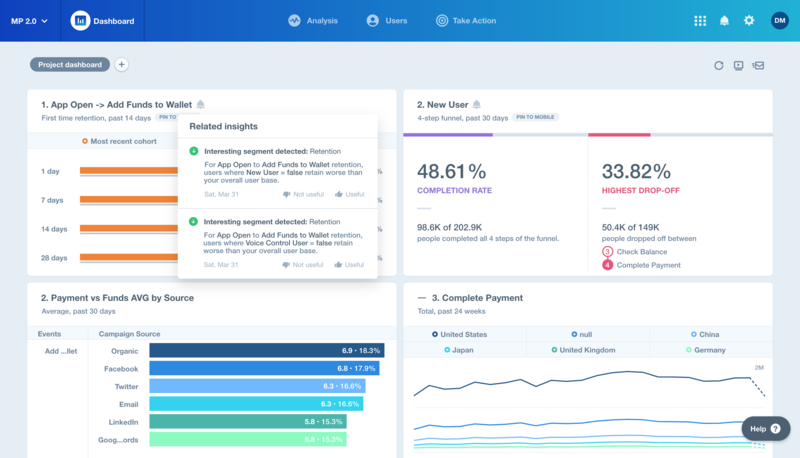 Quickly view all relevant metrics in one place and have high and low performing groups of users surfaced automatically that your team can review, monitor, and act on. Analyze user engagement data from multiple sources (no SQL knowledge required). 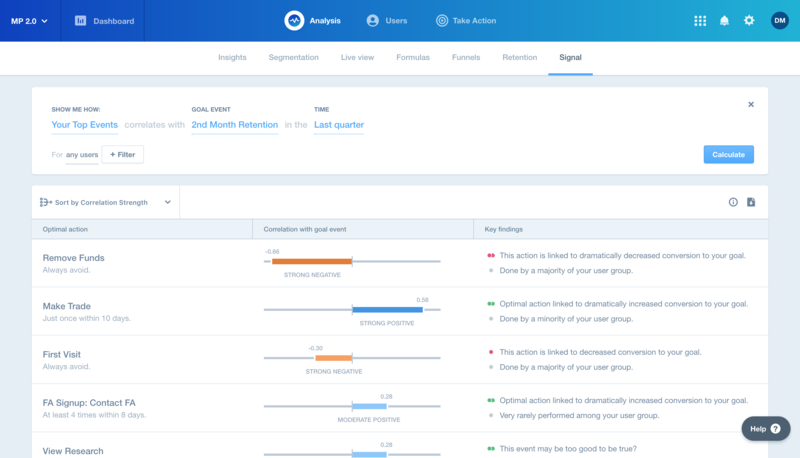 Pick any event you’re tracking, such as 2nd month retention, and Mixpanel’s algorithms will surface user actions correlated with your goal. When you use Segment to send data to Mixpanel, instead of needing to work with different Mixpanel APIs and SDKs, your developer only needs to learn Segment’s API and 3 simple methods: identify, track, and alias. Once Segment is installed, your customer data will also be sent to your other tools like email, chat, push, ad conversions, etc. There are many cases where you’ll be able to access additional data in Mixpanel that, without Segment, wouldn’t have been there in a typical Mixpanel implementation. This is because several email integrations that Segment offers also push activity back through Segment and out to connected integrations (like Mixpanel). That means you’ll see events like Email Delivered, Opened, Clicked, etc. 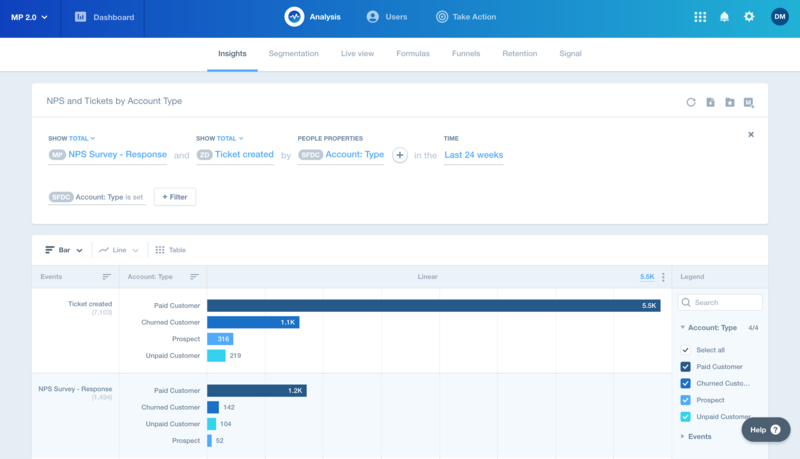 in your Mixpanel reports without needing to establish custom Mixpanel event tracking. These types of automatic events also work for most live chat integrations. With Segment piping customer data throughout, you’ll see Live Chat Started, Message Sent, etc. showing up in Mixpanel as long as the live chat integration and Mixpanel are both loaded by Segment.